Original CIRCA 1963 double brick & tile character home set on rectangular triplex zoned 916sqm corner block. The location is highly sought after only 100mt to the beautiful Tomato Lake and walking distance to Belmont Forum with easy access to the Graham Farmer Freeway. Character lovers the home is in original condition but perfectly maintained ready for your full custom renovation and a romantic white picket fence. Perfectly positioned to retain the home and subdivide a large street frontage block with wide front to build your dream home in quiet side street. Professional developers can demolish existing home and build three luxury single or double storey homes all with 15mt frontages. The choice is yours! *HUGE 916SQM CORNER BLOCK ZONED R20/30. *SOLID DOUBLE BRICK & TILE CONSTRUCTION. *FULL LENGTH COVERED FRONT ENTRY PORCH. *CLASSIC ENTRY HALLWAY W- LINEN CUPBOARD. *COUNTRY STYLE KITCHEN W- ORIGINAL METER. * MASSIVE LOUNGE/FAMILY W- OPEN FIREPLACE. *HIGH CEILINGS PLUS RAW JARRAH FLOORBOARDS. *ORIGINAL BATHROOM WITH SEPARATE DEEP BATH. *MASSIVE LAUNDRY WITH WCS & SECOND LINEN. *THREE DOUBLE SIZE BEDROOMS PLUS ACTIVITY. *SPRAWLING YARD W- 45MT FRONT TO MERCURY. *POWERED 18SQM STUDIO GREAT FOR HOBBIES. *NUMBER OF SHEDS & ESTABLISHED SHADY TREES. *LOCK UP GARAGE PLUS PARKING FOR 3-4 CARS. *ESTABLISHED BORE/RETIC LAWNS & GARDENS. 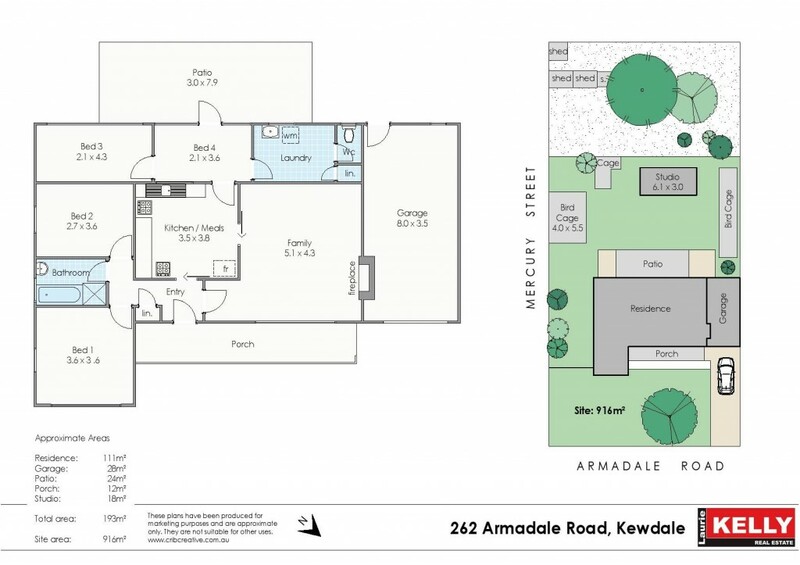 *RETAIN EXISTING HOME & SUBDIVIDE BLOCK. *BUILD THREE SINGLE/DOUBLE STOREY HOMES. *DEMOLISH HOME & SUBDIVIDE THREE BLOCKS. *CLOSE TO OPTUS, BURSWOOD, VIC PARK & CBD. To discuss your development options contact leading LOCAL agents DEVON KELLY 0417 936 277 & DANIEL KELLY 0456 180 575 and secure this amazing property.